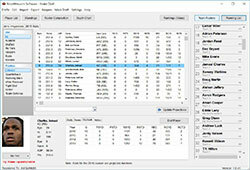 Customize your scoring system with over 30 stat categories. 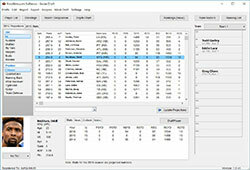 Customizable roster setup – including Team QB, K and D slots. View player rankings or auction dollar values – with projections. 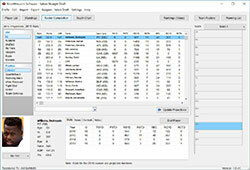 Run your own mock drafts from within the software. Color-coded player tiers, sleepers, and busts. Browse through RotoWire's up-to-date NFL depth charts. See average draft position (ADP) data from MyFantasyLeague. 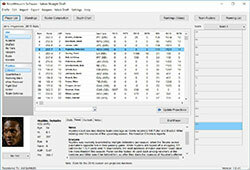 Download RotoWire projections and reports to Excel. Customize the player pool from any combination of NFL teams. Set up any size draft (snake or basic) or auction. Import (even from Mac/IOS) and export between computers. 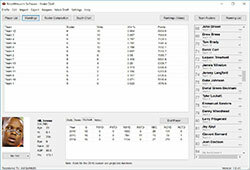 Set up and save multiple fantasy football drafts or auctions. How do I update the projections?. Please note that you will need a current RotoWire subscription and an active internet connection in order to download the most recent projections. In order to update the most recent projections, simply click on the "Update Projections" button located beneath the player list window. You may be prompted to enter your RotoWire username/password in order to initiate the download. Can I transfer my drafts/auctions to another computer? Yes. To export your draft file to RotoWire’s servers please take the following steps. Open the software → Export → Export Draft to RotoWire Servers To import the draft file you just exported to RotoWire’s servers please take the following steps. Open the software on your second PC → Import → Import Draft From RotoWire Servers → Select your draft → Import Draft. Can I use the draft software offline? Yes, the software can be utilized offline. If you plan on using the software without an internet connection, we highly recommend running a projections/player data update as close as possible to the start of the draft. That way, you will be using the most accurate projections as possible, and will reduce the risk of missing an important injury update. I subscribed through RotoPass. Can I still access the software? The NFL Draft Software is included with a RotoPass subscription, but you may need to contact support@rotowire.com for help getting it unlocked. Your RotoWire.com log-in information is auto-generated when you sign up for RotoPass, and is not the same as your RotoPass account. If you e-mail support, we can provide that auto-generated information. Alternatively, you can include your Software ID in the e-mail, and we will reply with the corresponding unlock code. Will the software work on Macs? There are players missing from the free agent lists. How can I add them? If you are missing players from the available players list, you likely just need to update your projections. The initial download of the software includes projections from June. Some players get traded or are added to our projections after that first set of projections is produced, so they may not appear in the software until the data is updated, or a projection is made. If you have double-checked your spelling and are certain a player is missing, we recommend using a "substitute" player (player you know won't be drafted that you can use as a replacement) until we get that specific player added. How do I print dollar values and results? While there isn't a way to print directly from the draft software, you can easily print these items from any spreadsheet software. Here's how you do it: 1) Select "Export" from the top menu, then select Export Player Lists to CSV. 2) Select a location on your computer where you want the data saved and click “Save”. This will save your data in comma delimited format as a .csv file. You can open this file in just about any spreadsheet software, including Excel. Once you have that file opened in a spreadsheet program it's quite easy to print (usually by selecting “File” then “Print”). Can I import a draft from last season? 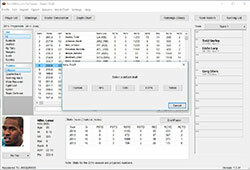 How do I input my league’s custom scoring settings? 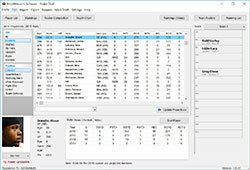 To input your league’s custom scoring settings, please go to Drafts → Edit Draft Settings → Scoring → Enter your league’s custom scoring settings (If you have the “Use same scoring for all positions?” option set to “No”, you will need to input your league’s custom scoring settings for each individual position (QB, RB, WR, etc.) 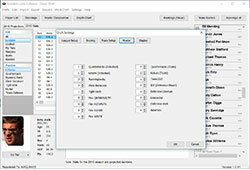 by using the “Position” drop down menu to toggle between positions). How do I set up a PPR league? To get the rankings to account for a PPR format, you will need to edit the scoring settings. To do this, please go to Drafts → Edit Draft Settings → Scoring → Input “1” into each “Receptions” field → OK. If you have the “Use same scoring for all positions?” option set to “No”, you will need to input “1” into each position’s (QB, RB, WR, etc.) 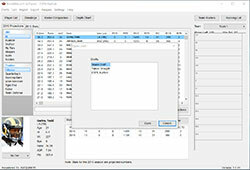 “Receptions” field by toggling the “Position” drop down menu. How do I select my team’s draft position? To select where your team picks in the draft order, please go to Drafts → Edit Draft Settings → Team Setup. Your team will be set with the No. 1 overall pick by default. To change this, drag Team 1 to a new position in the draft. (Note: To delete a team, check the box next to the team you wish to delete and click “Remove Selected” at the bottom of the list). We DO NOT RECOMMEND changing the draft order or number of teams after picks have already been made. How do I enter custom team names for my league? To enter custom team names for your league, please go to Drafts → Edit Draft Settings → Team Setup → Double click on team name you’d like to change (Team 1 for instance) → Enter custom team name in text box → OK → Repeat process for as many teams as you’d like → When finished click OK.
How do I input my league’s roster format? To input your league’s roster format, please go to Drafts → Edit Draft Settings → Roster → Input your league’s roster format → OK.
How do I change which stats are displayed in the player list window? 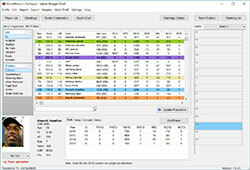 To change which stats are displayed in the player list window, please go to Drafts → Edit draft settings → Display → Drag and drop the stats you would like to be displayed in the player list window to the top of the stats categories window (You can assign which stats are displayed for each individual position by toggling which position is being altered via the Stats for Pos: drop-down menu) → OK.
Can I do a mock auction with this software? Our draft software does not support mock auctions at this time. Can the software sync up with a live draft on other sites (i.e. ESPN)? This ability is not supported at this time, but it's a possibility we're exploring for future seasons. On the bright side, our developers have made a concentrated effort to make following along with a live draft as easy as possible. In most cases, a player can be added with just two clicks. Can I manually change the projections? Due to the complexity of our value-based rankings formula, we are unfortunately unable to offer the users the ability to edit projections. However, we do include a Manual Rankings feature for snake drafts. To access this, click on "Rankings: Value" from the main view, and select "Manual" from the drop-down menu. When you are finished re-ordering the players, click on "Done" to save your changes.